By default, Google Chrome browser does not open in private (or incognito) mode. You need to use either of methods to start private browsing session in Chrome browser. Do you want Google Chrome browser to always open in private mode automatically without having to manually switch between normal and private mode? For this, we need to modify Google Chrome shortcut to launch Chrome in private mode instead of normal mode. Once we do that, whenever Google Chrome icon is clicked – it will launch Chrome in private (incognito) mode instead of normal mode. 1. Click Start and type Google Chrome. Then right click on Google Chrome icon and click Properties option. If you use Google Chrome icon on the desktop to open browser, then right click on that icon to open Properties box of that icon. 2. In Google Chrome Properties box, click on the shortcut tab and then look for file name in the target option. Add -incognito at the end of the existing file name in the target box. Then click Apply and OK buttons. Now click on Google Chrome icon, it will open in private (incognito) mode by default. If you want to revert back to normal mode, just delete -incognito added at the end of file url in the target box. 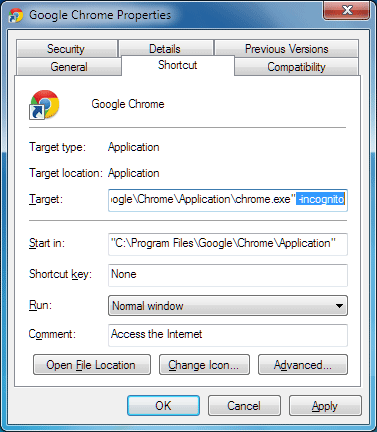 If your computer setup does not require saving or checking of internet history cookies – then using private mode Google Chrome by default is a handy option. No hard drive space will be hogged by internet cookies and files. On the other hand, you do not have to waste time in delete temporary internet files stuff on regular basis.